This book is the first detailed examination of George Abraham Grierson's Linguistic Survey of India, one of the most complete sources on South Asian languages. It shows that the Survey was characterised by a composite and collaborative mode of producing knowledge, which undermines any clear distinctions between European orientalists and colonised Indians in British India. Its authority lay more in its stress on the provisional nature of its findings, an emphasis on the approximate nature of its results, and a strong sense of its own shortcomings and inadequacies, rather than in any expression of mastery over India's languages. The book argues that the Survey brings to light a different kind of colonial knowledge, whose relationship to power was much more ambiguous than has hitherto been assumed for colonial projects in modern India. It also highlights the contribution of Indians to the creation of colonial knowledge about South Asia as a linguistic region. Indians were important collaborators and participants in the Survey, and they helped to create the monumental knowledge of India as a linguistic region which is embodied in the Survey. 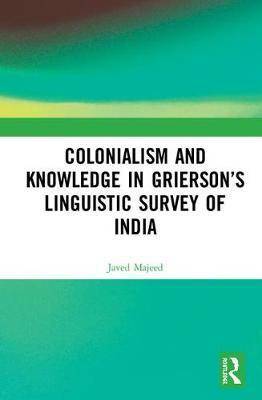 This volume, like its companion volume Nation and Region in Grierson's Linguistic Survey of India, will be a great resource for scholars and researchers of linguistics, language and literature, history, political studies, cultural studies and South Asian studies.